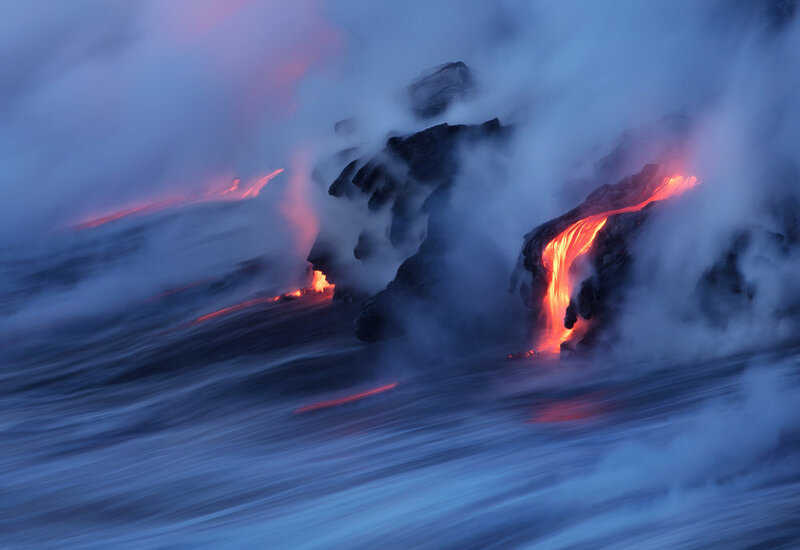 Personal Favorites 1:2s "Crimson Cord"
In November of 2016 we hired Bruce Omori, our friend and lava expert, to guide us to the Kilauea ocean entry on the Big Island of Hawaii. We woke up at 2am every morning and would start the hike out across the black landscape. It was incredible hiking across miles of dried lava rock with the only light coming from the glow and plume of the distant lava ocean entry. The red glow, and sulfur plume almost looked like Armageddon on the horizon. Equipped with thick hiking boots and breathing respirators, we arrived at the ocean entry about an hour before sunrise. From a rock outcropping, we had a perfect view of the lava as it literally boiled the ocean waves. A half second exposure added a slight motion blur to the outgoing wave in the foreground. The juxtaposition of both incredible beauty and ominous power shown in this scene has made this image a personal favorite of mine.